Homecoming was an easy win for 10 area high schools that participated in Royer’s fundraiser. By signing up, the schools’ homecoming committees earned a 10 percent commission on their portions of online corsage and boutonniere sales that totaled $4,538.52. The participating high schools: Cedar Cliff, Cedar Crest, Central Dauphin, Central York, Christian School of York, Ephrata, Hershey, Manheim Township, Northern, Warwick. The schools may use the reimbursed funds at their discretion. Royer’s plans to offer similar fundraisers next year for homecoming and prom, again open to all high schools in Berks, Cumberland, Dauphin, Franklin, Lancaster, Lebanon or York counties. For more information, contact Jaime Kevles, Royer’s marketing coordinator, at jaime.kevles@royers.com. Homecoming can be a nervous time for high school students. Never mind asking someone to the dance; it can take real courage when it comes to choosing your date’s corsage or boutonniere. Rest assured, Royer’s is here to help. That was part of the message shared today by Erica Bixby of Royer’s when she visited Fox 43 Morning News. Erica and host Amy Lutz discussed homecoming stalwarts and newer options. Standard corsages start with a white ribbon but can be spray painted (she demonstrated with green) to match a dress color. A variety of ribbons, bracelets and rhinestones can be added, as can, of course, a rainbow of flowers to make for a one-of-a-kind look. “It’s really like artwork,” Amy said. As an alternative to a corsage, Erica suggested a hand-tied bouquet, such as the one she held up featuring sunflowers, solidago, mini green hydrangeas, Italian ruscus, and seeded eucalyptus with a burlap bow. Erica noted that it’s a good idea to consider a date’s mother, too, at homecoming. “It’s always good to bring mom some flowers,” Erica said, holding a rose bouquet. “And that’s [true] for the guy or girl,” Amy said. Of course, you’ll find homecoming help at all of our stores, or try out our corsage builder. Kara Rickenbach approached Royer’s with a fundraising idea for Manheim Township High School’s Mini-THON in February. Rickenbach, a junior and head of the Lancaster County school’s donor and alumni relations committee, wanted to sell corsages and boutonnieres to classmates attending homecoming in October. Working with Pam Sigel, who manages Royer’s Lancaster North store, Rickenbach and other committee members took orders during school lunches. Earning a 15 percent commission on their sales, the committee raised $413.86. The school’s seventh annual Mini-THON, scheduled for Feb. 24, will benefit Four Diamonds at Penn State Hershey Children’s Hospital. Cheryl Brill, Royer’s vice president of retail operations, said the company hopes to build on Rickenbach’s efforts by working with Manheim Township and other high schools on similar fundraisers. Photo: From left, Christopher Sneeringer, Mini-THON advisor, and Kara Rickenbach, donor and alumni committee chair, Manheim Township High School; and Pam Sigel, store manager of Royer’s, 873 N. Queen St., Lancaster. 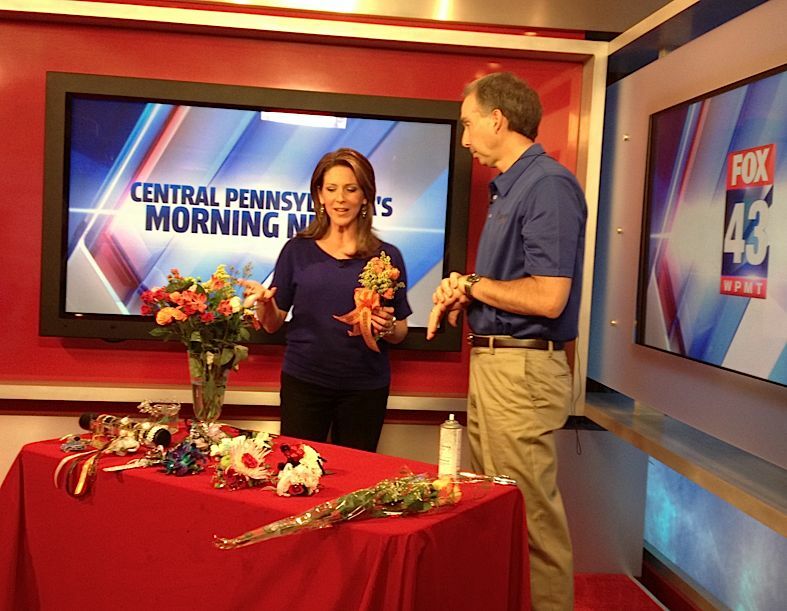 Royer’s Barry Spengler joins Heather Warner on Fox 43 Morning News. It was a sort of homecoming for our Barry Spengler, making his first appearance on Fox 43 Morning News in a number of months. But Barry was there to talk about a different kind of homecoming: the high school dance kind. Joining Fox 43’s Heather Warner, Barry showed some of the bling and accents that are popular these days. Homecoming, he said, tends to be less formal. Not all girls go to homecoming with a date but rather attend with a group of girlfriends. Parents can make it special by getting “a little something” for them, Barry said, holding a small wrist corsage. For guys who want to make a really good impression: While you’re getting a corsage for your date, try also bringing a single rose for her mother.